VentureSkies supports Sales Teams to have more successful conversations with potential customers. Bringing in new customers is vital to the success of any company. Acquiring high quality leads is a first step, but also one of the biggest challenges businesses are facing today: The Internet has turned the customers' buying process upside down, while business leaders often lack resources in staffing, budgeting, or time to drive effective online lead generation campaigns. VentureSkies lead generation services cover the entire process of stimulating and capturing interest in your product or service for the purpose of developing your sales pipeline. Instead of cold calls, your sales team will be able to talk to leads who already showed an interest in your products or services. High Tech companies as well as Cloud Service Providers are competing for only a handful of positions at the top of search-engine results pages, expecting to be better found by their prospects, generation more leads and making more revenue at the end of the day. Besides having a responsive, well designed user-friendly website, "Trust” and “Authority” are major drivers of search engine success. 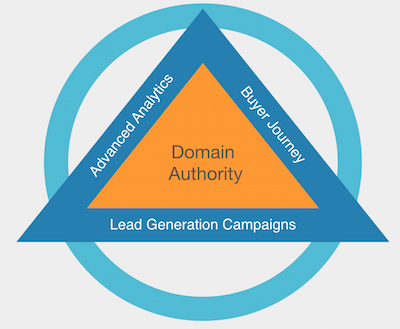 Becoming a trusted advisor, a domain authority or an online domain authority - how Google calls it - is the key to lead generation success. At VentureSkies, we consider lead generation as active business development. We focus on attracting potential buyers to your business, collecting their profile information to build up continuous relationships and delivering high quality leads to your sales team. Everything we do is driven by data and analytics. Compelling content plays a huge role in generating leads. Through social media and sharing, blog articles, infographics as well as SEO and PPC, we will place your content wherever your potential buyers may be looking for relevant information to solve their business challenges. This way we are creating the interests of prospective customers in your product or service. A successful client lifecycle requires optimizing the process for converting visitors into leads. Free-of-charge educational tools will confide your visitors in your offering, allowing you to both obtain their email address and educate them on your business. Examples relate to training video series and eLearning, free trials, Webinars, ebooks and White papers, a set of bonus tips or an interview with an expert on a relevant topic. Once prospects engage with your organization we will keep on providing them with valuable content and slowly educate the prospect on the key considerations for their purchase decision. At a certain point in time, your prospect’s online behavior indicates that they might be ready to engage with your sales reps in an individual discussion about your products and services. We are able to figure out who might be ready to buy by analyzing and prioritizing your leads according to their levels of engagement with your company. This is the point, when we hand-over leads to your sales team. Based on the buyer education that has been built in the earlier stages of the lead generation process the sales pitch will be much more focused and effective. VentureSkies delivers high quality content targeted at engaging your audience. This makes it much easier to get C-Level buy-in. Scoring leads ensures that only the most qualified get passed on to sales. Sales reps stay focused on their best opportunities and close more sales. Businesses differ in their strategies and needs. VentureSkies offers different price plans to grow your customer base. Benefit from an agile, market-driven back-office without suffering the burden of employing full-time personell.